Published: Nov. 4, 2018 at 01:49 p.m.
Washington Redskins cornerback Quinton Dunbar intercepts Atlanta Falcons quarterback Matt Ryan for 24 yards. Published: Oct. 23, 2017 at 08:56 p.m.
Washington Redskins cornerback Quinton Dunbar picks off Philadelphia Eagles QB Carson Wentz. 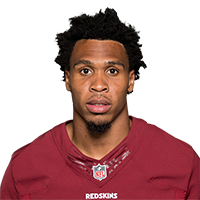 Published: Oct. 2, 2016 at 03:22 p.m.
Cleveland Browns fullback Malcolm Johnson fumble recovered by Washington Redskins cornerback Quinton Dunbar. Published: Sept. 25, 2016 at 03:50 p.m.